Traveling anywhere with kids takes a little extra planning and packing, especially when your children are young. 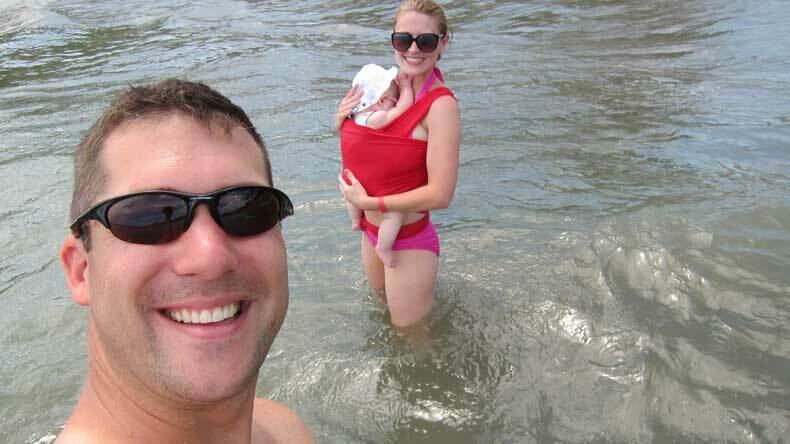 Beach vacations can be a lot of fun with babies and toddlers. They have an endless sandbox, water to play in, and a new environment to explore. What is not to love about the beach? If you’re planning a trip to the beach, or any tropical destination, here are a few beach essentials for toddlers and babies to make your trip both fun and safe. This is a no-brainer. If you’re going to a sunny place, you need to pack the sunscreen. This is especially important for a baby or toddler’s sensitive skin. Babies can burn much easier than adults. I lather up our daughter at least once every two hours using an SPF of at least 50. We reapply every time our little one gets out of the water, as well. There are several great sunscreens that are safe for kids. Look for one specially formulated for an infant’s delicate skin. I lather our baby everywhere before we get her dressed. I put the sunscreen on her chest, tummy and her back even though those areas will be covered by her bathing suit. Also, don’t forget the ears, bottoms of the feet, palms of the hands, and the scalp. Once again, it’s all about sun protection. Even if your baby has a head full of hair to protect her delicate scalp, a sun hat is still a beach basic. It will help keep her cool and protects her from getting a sunburn on her scalp (especially where her hair parts). Plus come on, how cute is baby in a sun hat?! Don’t forget about baby’s eyes! 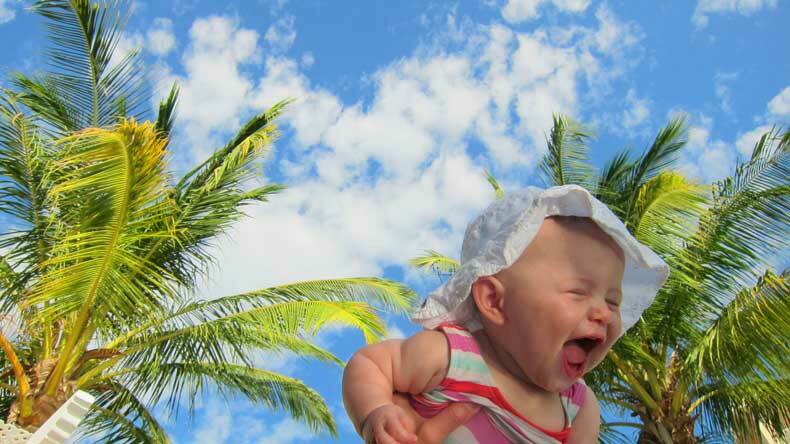 Particularly during the first year of life, a baby’s eyes are extremely sensitive to the sun. 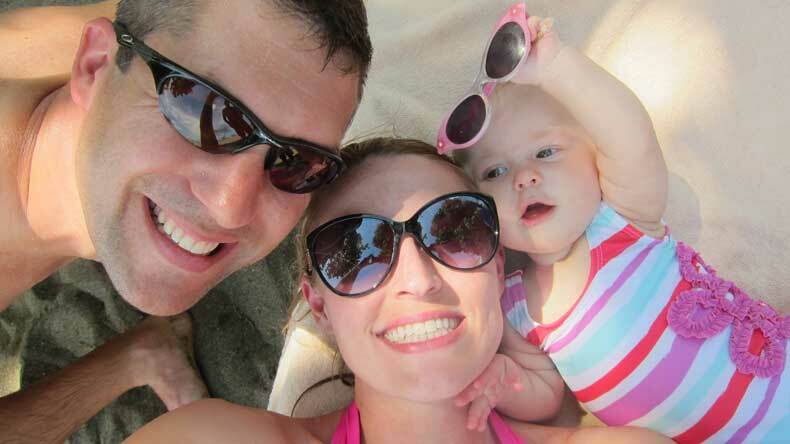 Even into their toddler years, it’s a good idea to protect your child’s eyes from the sun. Personally, our daughter hates the sunglasses with the strap around the back but loves traditional sunglasses. This brand is my favorite. They are inexpensive, come in a lot of fun colors and include a convenient, protective carrying case. Most swimming pools require a swim diaper. You can buy disposable ones or reusable ones. Swim diapers are a beach basic to be worn under a swim suit or alone. They do not absorb urine, but do catch any solids, in the event that your little one has a bowel movement. If your little one is already toddling around, you may want to buy a pair of water shoes to be worn on the beach. This will protect your toddler’s feet from the hot sand or from rocks and anything else that might not feel so good if stepped on. Water and warm weather are breeding grounds for mosquitoes, so you will want to bring a spray to protect your little one from being bitten. Doctors do not recommend using DEET on children under six months old, so I would recommend this mosquito spray. If you want something a bit more natural, we used a homemade blend of essential oils when we went to Costa Rica, and it worked wonders! This will come in so handy if you want to go into the swimming pool or even in the ocean. (Shallow area only, of course). This water wrap is made out of jersey material, so it’s thin and breathable. It’s intended to be worn into water and will dry quickly. If you’ve ever worn your baby in a wrap, you put this one on the exact same way as a Moby, Boba, or Tula Wrap. You can use a wrap in the airport, too, which makes flying with a baby much easier! Any parent of a toddler knows how quickly a little one can get into mischief if you look away for even half a second. While nothing replaces actively watching your child around water, a flotation vest will add an extra layer of protection. This should be on every parent’s beach essentials for toddlers, especially. If the beach you are visiting does not have adequate shady in the form of umbrellas or trees, you may want to invest in a beach tent. Beach tents are easy and quick to set up and offer protection from the sun. They also provide a place for your baby to nap if they get tired or a place to keep your belongings while you are out enjoying the water. Toys aren’t necessarily beach essentials for toddlers and babies, but they sure make the trip more fun. An inexpensive set of sand molds and digging tools can keep kids entertained for hours on the beach. It’s a fun way to engage with your child and enjoy the beach without actually getting in the water. 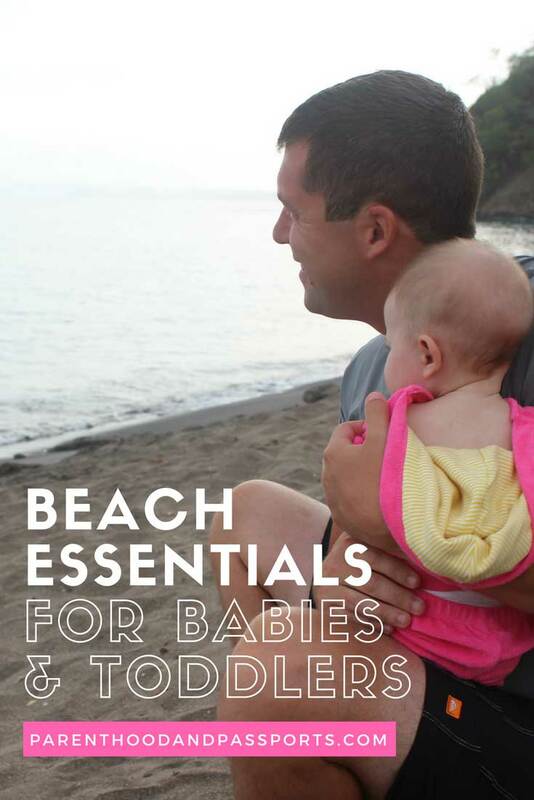 Don’t forget these overlooked beach essentials for toddlers and babies, too! Besides the items mentioned above, don’t forget these other baby beach essentials when you are out in the sun. These include extra fluids (water, milk, or formula), a towel, shade umbrella, dry clothing to change into afterward, and a water resistant beach tote to carry it all! When it comes to a beach vacation with the family, this water bottle is worth the splurge. It keeps fluids cool for up to 24 hours. So even if you are out in the hot sun all day, your drink will stay refreshingly cool! For this reason, I consider it one of my baby beach essentials! You would be surprised how many people forget to bring a towel when going to the beach. Opt for a quick drying towel so you can use it more than once in the same day. This gives you the option of playing in the water in the morning and afternoon. For little girls you can also invest in a terry cloth bathing suit cover up that they can wear to lunch at a beachfront restaurant. 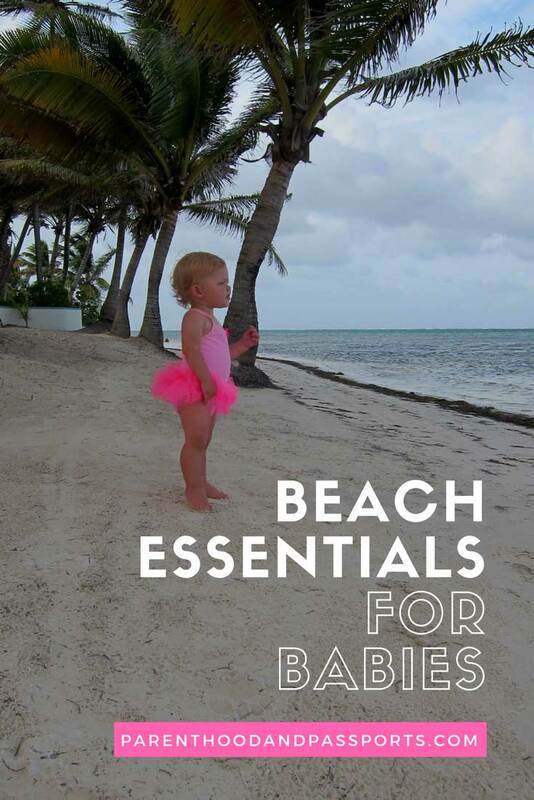 What are your most valuable beach essentials for toddlers and babies? Leave us a comment with the items you pack for a beach trip with your baby or toddler.